The lecture looks at the ambiguity of the term “Jewish Question”, which refers to both the historical attitude of Marx with respect to the condition of the Jewish communities in 19th century Europe, and to the philosophical developments reflected in the 1844 article for the Deutsch-Französische Jahrbücher, “Zur Judenfrage”. Here, in reply to Bruno Bauer’s homonymous brochure, Marx would propose his first analysis of the value and limitations of bourgeois “juridical universality”. The lecture deals with the tension in Marx’s theory between a “secular” theory of the political in terms of radical democratic emancipation and a “messianic” reinterpretation of the function of the Chosen People. 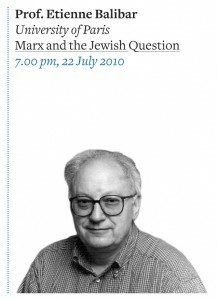 The lecture tries to assess the extent to which Marx’s dialectic of community and universality constituted a real alternative to the development of Modern Jewish Nationalism or simply represented its inverted image. Etienne Balibar was born in Avallon, France in 1942; he has taught at the Universities of Algiers, Paris, Leiden, Nanterre and is now Emeritus Professor of Moral and Political Philosophy at the University of Paris 10 Nanterre and Distinguished Professor of Humanities at the University of California, Irvine. He is also teaching at the Centro Franco-Argentino de Altos Estudios, Buenos-Aires, and the Center for Comparative Literature and Society at Columbia University, New York. His books include Reading Capital (with Louis Althusser, 1965), Race, Nation, Class. Ambiguous Identities (1991, with Immanuel Wallerstein), Masses, Classes, Ideas (1994), The Philosophy of Marx (1995), Spinoza and Politics (1998), Politics and the Other Scene (2002), We, the People of Europe? Reflections on Transnational Citizenship (2004). Forthcoming are Extreme Violence and the Problem of Civility (The Wellek Library Lectures, 1996), and Citoyen Sujet, Essais d’anthropologie philo­sophique (Presses Universitaires de France). Balibar is a member of Ligue des Droits de l’Homme (Paris), with a particular interest in the rights of migrants and asylum seekers. He is co-founder of Faculty for Israeli-Palestinian Peace and acting chair of Association Jan Hus France. Organised by the LBI London and the Jewish Museum Frankfurt/Main in cooperation with Queen Mary University. We would like to thank our sponsor Bank Sal. Oppenheim jr.&Cie. Click here for the entire programme of the European Leo Baeck Lecture Series London 2010.